Is the advertising recovery we’re witnessing as unbalanced as anything that occurred in the City of London during the run-up to 2008? That’s what I’m starting to wonder. Take DMGT’s Q2 numbers, which disclose that retailers once again outperformed the broad advertising market, increasing their expenditure Associated Newspapers by 19% YOY. Overall, ad revenues at Associated climbed by 15% during Q2. At Associated, retail is almost certainly the largest vertical sector in terms of ad revenues — bigger than cars, telecoms and IT or financial services. 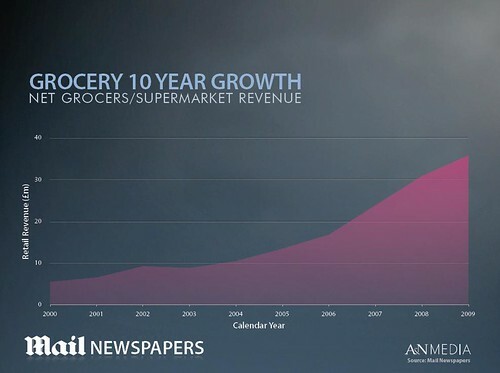 Anecdotal evidence suggests that retailers have become similarly important at Trinity Mirror’s nationals and The Sun. The slide at the top of this post, taken from a recent presentation by Guy Zitter, the MD of Mail Newspapers, shows that retailers bought roughly £80m-worth of display advertising from The Mail and Mail On Sunday last year. This year, the retailers’ contribution could rise to £100m. This represents a big proportion — perhaps one-third — of the display ad revenue generated by Zitter’s newspapers. Drill down a little deeper, and you find that almost half of Mail Newspapers’ retail advertising — nearly £40m-worth of it last year — came from supermarkets. Remarkably, the supermarket have more than trebled their expenditure at DMGT during the past five years. Moreover, the supermarkets have behaved like no other sector during the recession. Unlike everyone else, they continued to spend more and more on press advertising. (Other retailers, by contrast, slackened off a bit, but certainly didn’t hit the breaks in panic mode.) Among the nationals, the supermarkets’ behaviour put a floor under the worst effects of recession, blunting its impact. In the end, the really important question for publishers is how much longer the big retail chains will be able to increase their expenditure at this rate. No-one knows. And therein lies the problem. If the supermarkets’ priorities change in the context of a double dip recession, or for any other reason, things could very rapidly start to look ugly for the national press. Look further ahead, and a bigger challenge looms. Most retail advertising is tactical, price-based, stuff designed to pull shoppers through the doors. When it comes to this kind of advertising, the web hasn’t dealt a death blow to newspapers. Quite the opposite, in fact. But mobile advertising could be a very different proposition. Geolocation-based offers that appear on shoppers’ handsets as they wander down the High Street, or in advance of a planned shopping trip, won’t spell the end of newsprint. But they will hit newspapers where it hurts.